I was so excited when I received my invitation from Belk to attend a brunch they were hosting with Betsey Johnson at their South Park Mall location in Charlotte, NC. She is definitely the fashion industry’s most whimsical and modern designer and a chance to chat one-on-one with her was such an awesome opportunity I didn’t want to miss! I had also recently seen her on one of my favorite shows on TV, Dancing With the Stars, and was so impressed at all her fabulous moves including her famously known split! So off to Charlotte I went and my experience was much more than I had expected! Besides being such a talented designer (and dancer), Betsey was one of the most kind, friendly and generous ladies I have ever met. She took time to pose for pictures with each of us that had been invited and answered all the questions that were asked. Personally, I think she would have stayed and talked all day had she not had to get ready for her public appearance downstairs in the Belk store where some very excited people were waiting in a line that wrapped around the entire floor. I was fortunate to be able to take my beautiful, fashionista mom with me on this little road trip and we were able to enjoy some great Mother-Daughter time and awesome shopping at the mall while we were there. Of course we shopped til we dropped! She enjoyed meeting Betsey and was so excited to get to talk to someone who was just as short as she is! Next year will mark Betsey’s 50th year of designing! She stated she was initially inspired by Broadway chorus girl dancers and singers. She loved the make-up, hair and costumes they wore. At 72, she is still going strong and she looks fabulous!! She told the small group of us that fashion is up and down but if you love it, keep rowing the boat and never give up your dreams. She has worked with big and small companies but says she loves working with her own company the best. She only wants to dress people in things they love and feel good in. She said “beauty is in the eye of the beholder and you are the biggest beholder of what you wear”. 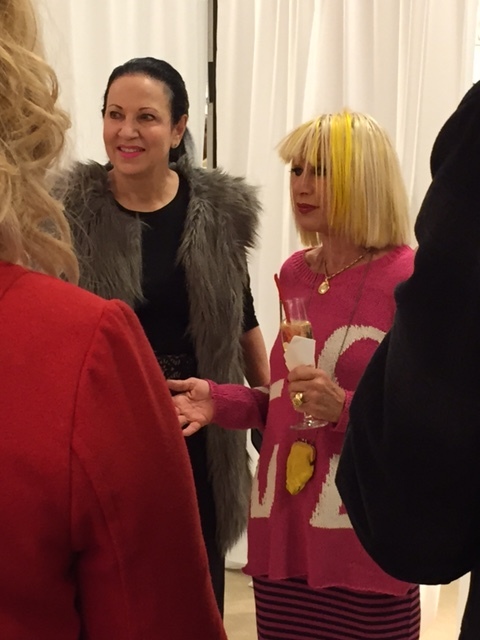 Betsey answered questions with our host for this event, Arlene Goldstein, who is Vice President of Trend Merchandising and Fashion Direction for Belk, Inc. I always enjoy seeing Arlene and spending time with her and it was great to see her again! 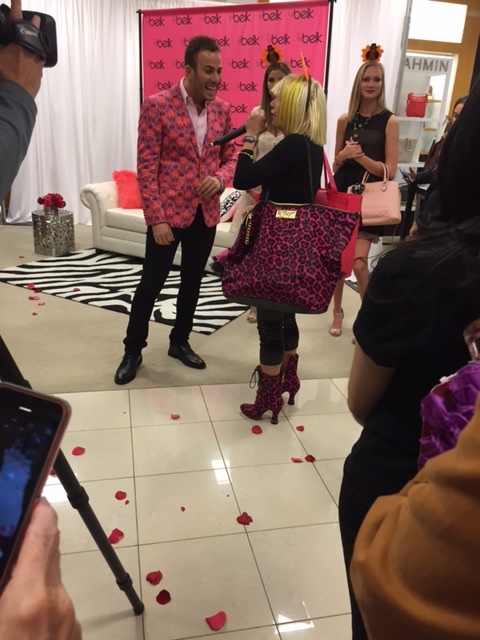 Later in the afternoon, Betsey greeted the crowd that had been waiting to meet her in the store by tossing rose petals out of her designer bag. The excited group had been entertained by Micah Jesse, national television personality and entertainment journalist. She then took time to talk with everyone and posed for more pictures. A few lucky attendees even received some great prizes from her collection. And of course, she was asked to do her famous split for the crowd and was happy to oblige! 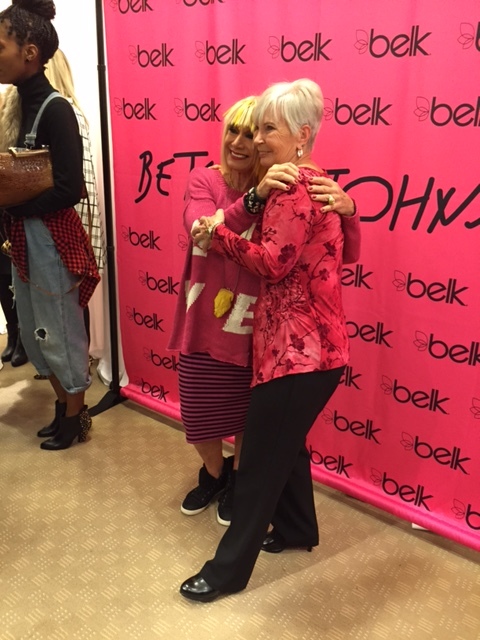 Thanks Belk for the great opportunity to meet such a sweet, talented and FUN fashion icon!